Villa Benita features upgraded furnishings as well as tray ceilings in the living room. Villa Benita`s front elevation features a circular driveway. Located on a gulf access canal with 25 minute access to open water through a bridge. Lush, mature landscaping. The boat lift is being used by the property owners boat. The tiled pool area faces south and offers plenty of lounging space. A fire pit as well as a gas BBQ are provided for. The swimming pool is electrically as well as solar heated. Comfortable under truss sitting area featuring a round table and seating for six. Chaise lounges and an umbrella are available. Under truss sitting area with comfortable cushions on the chairs. Nice view of the swimming pool and the southern facing canal. The living room features tasteful decorations, tray ceilings, lots of natural light, a large flat screen TV as well as a Bose stereo system. The dining room is surrounded by bay windows. The bright and open kitchen is directly next to the dining nook. All white cabinets as well as white appliances give this kitchen a nice clean look. Upgraded granite is featured in the kitchen. Bar stools as well as pendant lights are featured in the kitchen. View from the living room towards the kitchen. Directly when entering the front door, one is greeted by a standard size pool table. A pool table and comfortable couch. Tasteful wall paint in the great room along with a pool table. The full service office can be closed by doors for important on vacation business calls. The master bedroom features a king size bed, night stands, dresser as well as a large big screen TV. Sliding glass doors leading from the master bedroom to the lanai. View from the sliding glass doors into the living room. Dual sinks, soaking tub as well as a walk in shower are featured in the master bathroom. Master bathroom soaking tub and one of the two vanities. Walk in shower and separate toilet. Guest bedroom 3 features a queen size bed. Guest bedroom 3 features a flat screen TV. The guest bathroom has a walk in shower as well as a sink and toilet. Guest bedroom 2 featurs a queen size bed, night stands and a wall mounted TV. Lots of natural light in bedroom 2. 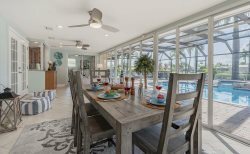 This Cape Coral vacation rental named Villa Benita offers an open floor plan is spread out over 2,100 square feet. Due to the over sized triple lot with no direct neighbors the house has a very peaceful and tranquil environment. The home is situated on the Tequila Canal with direct ocean access after a quick 20 Minute canal cruise with no locks. It has 3 bedrooms that are equipped with one king, one queen and two twin size beds, as well as two good size bathrooms and a pool bath. All bedrooms have flat screen TV’s. The open floor plan offers two living rooms, one of which features a pool table and a fireplace. The Den offers High Speed internet access. The main living area has very comfortable couches and a full HD 52" Sony Flat Panel Television featuring the Bose Home Theater System which makes for great music and surround sound. The open and very light kitchen features granite counter tops and is equipped with a great coffee/cappuccino machine. The swimming pool is solar as well as electrically heated and features an over sized pool deck which offer plenty of lounge space. The deck also has two sitting areas. With its south facing swimming pool, the home gets the maximum amount of sunlight to heat the pool and make for unforgettable sunsets. The home is situated on an over sized lot which offers plenty of privacy with no direct neighbors. The lighted garden and palm trees offer a unique ambiance for romantic dinners or grill party’s on the patio by the pool.Enough parking space in the private driveway. Garage is used by owner. The home also offers a monitored alarm system. Die Villa Benita bietet auf ca. 195 m² 3 Schlafzimmer, 2 Bäder, ein Büro mit High Speed Internetanschluss, eine große Eingangshalle mit Kamin und Poolbillardtisch, eine offene Küche mit modernsten Geräten wie Ceranfeld, amerikanischen Kühlschrank, einer autom. Capuccino Maschine sowie eine Essecke mit Blick zum Sonnenuntergang beim Kanal vor dem Haus. Das Wohnzimmer ist sehr gemütlich und bietet Kabelfernsehen mit Bose Home Theater. Jedes Schlafzimmer verfügt über einen Fernseher. Auf der Terrasse erwarten Sie 2 Sitzgarnituren in verschiedenen Bereichen und ein elektrisch sowie solar beheitzter Pool und eine außen Toilette mit Waschbecken. Durch das übergroße Grundstück haben Sie praktisch keine Nachbarn und genießen absolute Ruhe und uneingeschränkte Privatsphäre z.B. in einer Hängematte zwischen 2 Palmen. Die südliche Ausrichtung beschert Ihnen den ganzen Tag Sonne am Pool. Der Tequila Canal vor dem Haus ist sehr breit und bringt Sie ohne Schleuse in wenigen Minuten auf das offene Wasser, ideal für Bootsausflüge! Der beleuchtete Garten bietet ein super Ambiente bis spät am Abend. •Genügend Parkplätze in der privaten Auffahrt verfügbar. Garage wird vom Eigentümer benützt. Excellent as usual. Every member of the team is friendly and there to make our stay a great memory. It was very hard to leave. We enjoyed our stay and the beautiful home. Unsere Gaeste waren wie immer von der Villa Benita begeistert und kommen gerne wieder. It is amazing to see how happy our clients are in villa Benita. In all those years we only got more than positive feedback. Villa Benita is constantly updated and conveys the Florida feeling, that everybody looks for. Our guests reported that it was better than they expected. Better than on the pictures. They loved the privacy and the style / colors of the home. Our guests were more than happy and will come back soon. Our clients loved it. They say it was their best holiday ever. They will come back ! Thanks from the FTV team. our guests loved it a lot ! A dream vacation. Looking Forward to come back, hopefully very soon. A dream vacation home. We are coming back ! We had a wonderfull time in this very exclusive home. Our Kids loved the pool and the Billard table a lot.The sunsets around the fire pit table are priceless.